The house can accommodate groups of twenty two (22) people in nine (9) en-suite bedrooms; the house also provides large kitchen and dining areas for group meals; additionally the Big Pink House has its own bar - so you can even be 'landlord' during your visit. The house also has separate lounge areas plus a pool table room. Take a look around the Big Pink House. 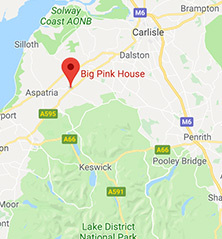 The Big Pink House provides excellent access to the northern Lake District, Cumbria. The house is a less than 30 minutes drive from the popular Lake District towns of Keswick and Cockermouth as well as the idyllic Lake District destinations such as Bassenthwaite, Lorton, Derwent Water and Buttermere. We are the ideal destination for family and social group gatherings. Corporate meetings and team building events will also benefit from this spacious property. Stag and Hen parties, please enquire for details. Unfortunately, the Big Pink House does not accept pets.